The strike price is the price at which the holder of the option can exercise the option to buy or sell an underlying security, depending on whether they hold a call optionCall OptionA call option, commonly referred to as a "call," is a form of a derivatives contract that gives the call option buyer the right, but not the obligation, to buy a stock or other financial instrument at a specific price - the strike price of the option - within a specified time frame. or put option. An option is a contract where the option buyer purchases the right to exercise the contract at a specific price, which is known as the strike price. Buying or selling options is a popular trading strategy. Option trading is not complex, but as with any other investment, having good information is important. 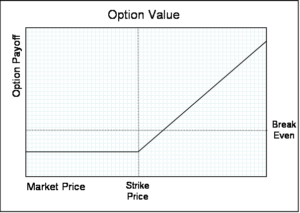 In the image below, we can see the strike price for a call option, which confers the right to buy at the strike price, and the break-even point where the option seller starts losing money. The buyer and the seller of a call option enter into an agreement, according to which the buyer gets the right to buy a specified number of shares of stock at a specified price and the seller receives the purchase price for the option in return for agreeing to sell the shares to the option holder at the strike price if the option holder elects to exercise their option. Options are only good for a set period of time, after which the option expires. The buyer of the option can exercise the option at any time before the specified expiration date. If the call option expires “out of the money”, that is with the underlying stock price still below the option strike price, then the option seller will profit by the amount of money received for the sale of the option. Here, the buyer and the seller of an option also enter into an agreement, according to which the option buyer can exercise the right to sell short shares of the stock at the option strike price. Again, the option seller receives the purchase price of the option, known as the “premium”. The buyer of a put option possesses the right, but not an obligation, to exercise the option and sell short the specified number of shares of stock to the option seller any time before the option expiry, at the predetermined exercise price. In this trade, the buyer of the option will profit if the stock price falls below the option strike price prior to expiration. The seller will profit from selling the option if the option expires out of the money, which in the case of a put option means the stock price remains higher than the strike price up to the date of the option’s expiration.